Any progress with the installation? My car goes in next week. Tracking down the connector took some time. I had the Mezerie pump and decided not to install it. One the plate and mounting was not simple, and I was afraid it would be too fast for a HE with Bar and Plate design. I think for those who have tube and fin HE's its a better solution for faster flowing pumps. My understanding Bar and Plate tends to flow more rapidly than tube and fin and you loose the efficiency if the coolant flows too fast. These new options sound like a good compromise between larger pumps and stock. If this SLS pump works, I would buy it to replace my CM30. Only due to the fact it has the AMG logo. Just to update you guys. I did install the new SLS pump. Friday. As I was driving to pick my truck up at the body shop I noticed my car was way down on power. Good think the body shop was right next to Dyno-Comp in Scottsdale. Being that it was Friday and my birthday. I was in no mood for troubleshooting. I just said "Hay my IC pump is bad, Lets swap it out for the new one sitting in my trunk". We did just that, but the car is still down on power, so I need to start troubleshooting the problem Tuesday. I'm sure I will get it sorted out, when I start playing with STAR and back on the dyno to check boost and stuff. But just an update, The pump is installed and I'm sure once we get the issue sorted out I will have some data for you guys. I thank dumb luck for letting me catch the problem before a CEL could pop up and about one street away from Dyno-Comp. I'm sure a lot of us know that feeling of "WTF! where did my power go!" "The complete RENNtech intercooler upgrade kit with pump and front mounted intercooler is available for $3,995.00"
Im sure they have made a killing off that, to rich people that just ship their car to them. Ok I just picked up my car. Ken from Evotech USA and Rich From Dyno-Comp both confirmed the max IAT on my was was 55c = 131 degrees Fahrenheit on the dyno. Outside temps were 80 degrees on the dot. Not sure what other guys are getting for IAT's or what other SL55's get for that matter. I do know the SL55 stock H/E is taller then the E55's, but it is behind a few radiators. So on my car (2005 SL55) with a stock cooling system saw a max temp on the dyno of 131 degrees after installing the SLS AMG pump. You guys tell me is this any good? What size pulley are you running since for stock I would think that isn't that great. Depending on what gear you did your pull in, for a 3rd gear pull thats not very good. If its a 4th gear pull that I'd say its working well. I'd much rather see road test to see how the real world treats your IAT's. Recovery is a big part of the puzzel. Anything over 120 and you will see timing being pulled, which is completly normal for stock or even modified cooling system. It was a 3rd gear pull on a dyno dynamics. Max speed was about 120mph. I just got off the phone with Rich at Dyno-Comp. As I was leaving he was going to dyno an E55 with a rear mount cooling system, meziere pump and FF headers and a 180mm pulley. When I was leaving I asked if he would just look at the IAT's for a comparison. Because I had no idea if 131 degrees was good or not good. The E55's IAT's topped out at 77C. That equals 170 degrees. I'm sure the rear mount cooler was not packed with ice. I even think the owner of that car is on this forum. Who that is, IDK? My power was up slightly. 177 is very poor, SC shuts down at 200. I'd say that is a bad IC pump. That car will shut down on the street in AZ heat after one pull. At the track I really shoot for 120 or less for a whole pass. 1 big problem, This pump is a PWM/LIN Bus connection. You may not be able to just connect 12v and expect it to work. It may need to be pulled apart and electronics bypassed OR the PWM/LIN might just be feed back to the ECU to confirm what the pump is currently doing. A little more needs to be checked on this for fitment issues but great find! When I contacted my friend at the Mercedes parts dpt. I wanted him to find the plug that mates to this pump. Turns out it was not able to be found in the system at that time. So I went out on a limb and contacted the BMW dealer (next door) I got the plug end for the BMW X6M twin turbo SUV, that used the smaller (less flow) version of this pump.. The plug end fit perfect. I believe Rich from Dyno-Comp was able to track down the pins that go inside the plug. Once they guys at DC figured out how the power setup of the pump worked. We were good to go. I remember Matt (one of the techs at Dyno-Comp) telling me the wiring was different. IIRC he said there were 2 power connections or 2 grounds. something of that nature. Keep in mind I sell no pumps so I have no reason to hype this pump over any other for that matter. I just want a good pump that isn't loud on my car. In the end its just another option guys have when picking a pump for their car. As long as that's already been looked into then it is another great option! Do you know if It fits My s65 Amg w221? Do i need to buy the connector too? Can you find out what the wire connections are supposed to be on this sls pump? I just bought one and there are 4 pins on the pump. The MB wire diagram shows pin 1 as ground, pin 4 as constant power, and pin 3 as a PWM output from the control unit. How did your guy eventually wire it up to work without using the PWM. Thanks for the help, really looking forward to getting this pump working. so what is the latest guys ? Any updates regarding the best pump out there ? 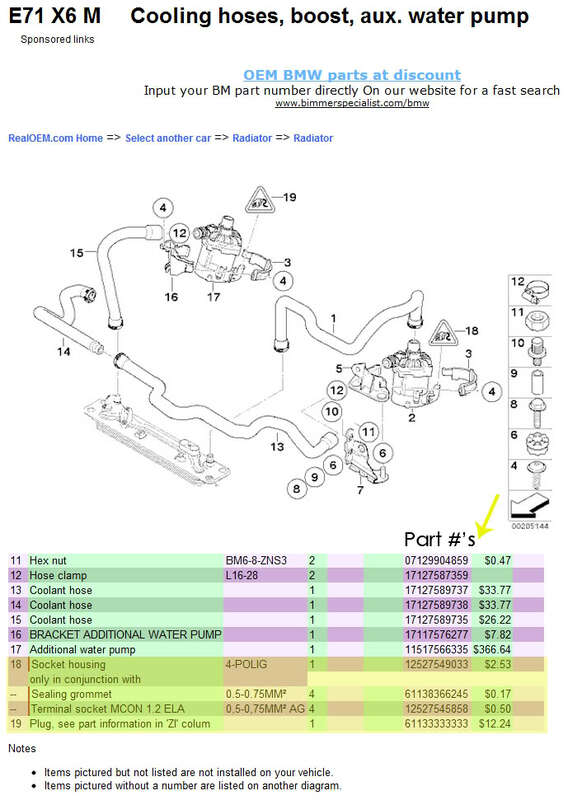 Could someone who installed this Mercedes SLS cooling pump Part number: A 000 500 04 86please provide me with the correct part number as well as the BMW Electrical connection part number I'll need in order to complete the installation. 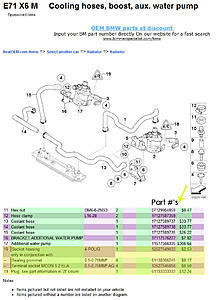 I checked with my local MB dealer, and they don't recognize this part number. Here it is. I would just order all the stuff I highlighted. Its cheap enough. Thanks, so at the end of the day, did this set up work out for you ok? Any modifications required?